The average of all those potential maximums for 2017 is 20795 km3. Now, the average of total melt for the past 10 years is 18269 km3, which means that at the end of this year's melting season the minimum could be only 2526 km3 (the lowest minimum on record reached in 2012 was 3673 km3). If we take the lowest amount of volume growth since the end of March (2007), and subtract the highest total melt (19693 km3 in 2010) from that potential maximum, the minimum could even go lower than 1000 km3! But that's just numbers. Even though it shows what's possible theoretically, we'll have to wait and see what the weather brings this melting season. Suffice to say that it would take some crazy circumstances for this theoretical extreme to become practice. And we also mustn't forget that PIOMAS and CryoSat-2 currently aren't in agreement on how much volume the Arctic sea ice pack represents (see the final part of last month's PIOMAS update). If you want to know how this discrepancy between model data and observations is evolving, keep an eye on the dedicated thread on the Arctic Sea Ice Forum. CryoSat-2 data is about to be updated as well. 3 SD is roughly 1 chance in a 100 below the trend lines. The nearly-unchanged anomaly is bad, the flattening thickness graph is worse, and the spatial distribution - if PIOMAS is even approximately correct - is terrible. None of this looks good and the ESRL temperature figures for March put 2017 as the hottest on record for the Arctic for both SST and 2m Air temperatures. That all suggests everything is primed for a larger tather than a smaller melt. The lowest volume on record is clearly an option and with two of the past 7 years losing 19.5K a figure below 1.5 K km^3 is quite possible at the minimum. The hyperbolic trend on the remaining volume indicates an annuial loss over 400 Km^3 per year and a total wipeout withing 6 years. Anything is possible. There is an old saying about "pictures speaking louder than words". I can think of many examples to back this up, but undoubtedly one of the best can be found amongst Jim Pettit's plethora of PIOMAS representations. I wonder to what extent we can expect positive feedback, and whether 20800km3 or so will prove significantly more vulnerable than the previous maxima of over 22000 km3. If it's thin enough to melt out earlier with higher albedo and more holes / exposed edges, we could see a very low minimum indeed this year. Huge amounts of ice have been exported via all the exits and continue to be as the pack is unprecedently mobile - this must play a part in the slow volume increase on top of the other factors(eg SSTs and atmospheric warmth), and doesn't augur well - just how open will the Atlantic front get by September. Is the atmosphere measurably getting thicker at the Arctic because of all this advection? Paddy, don't you mean lower albedo from thinness? Hi folks and hi Neven, quite a long time since my last time here, and here we are, keeping "going down", springsteen would sing. I have a question for Neven: good sense suggests that we're getting closer to the moment when the persistence of a high-pressure pattern over the Arctic is more detrimental to the ice than favourable. Currently HP is still associated with relatively low temperatures but I expect that in the next week the story will be much different. When does this normally happen? This switch of HP from "icing agent" to "melting agent"? By mid April, more or less? And the melting ponds? When are they starting to form? Thanks a lot, and I keep the chance to thank you once more for the fantastic work you do with this blog. I have gained a bit of learning about the NSIDC monthly SIE data. This resulted from some unwarranted criticism from me towards the NSIDC Arctic Sea Ice News bulletin covering the December SIE numbers. The daily trace of SIE (eg see ChaArctic with 'Show all') shows December 2016 continually tracking below all other years. So when the monthly figure for December was posted by NSIDC as a smidgen higher that the 2010 value (which remained 'lowest December on record') I assumed this had to be a mistake. It turns out, after some enquiries with NSIDC that the December SIE figure was actually correct. Imagine one 10 x 10 km grid cell (100 sq km). [Call this 'cell X'] Over a 30-day month, it is covered by 100% on 5 days and the other 25 days it is ice free. Thus for 'cell X' (and many others similarly), SIE can be 'boosted' by up to 85 sq km. 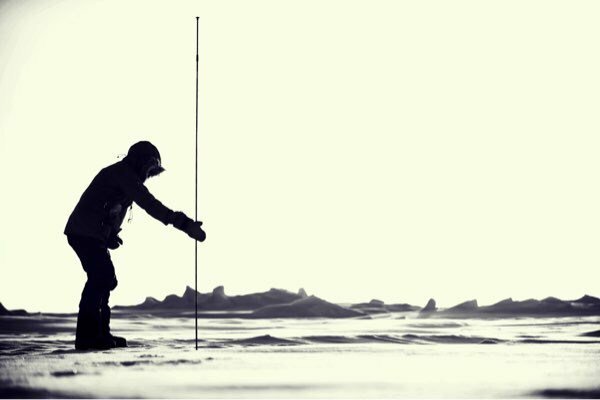 Of course, another way of seeing this is that daily sampling by using thirty-times more averaged data points is more accurate than the monthly cell sampling version, so the result will be closer to the actual Sea Ice Area. We are happy accepting SIA measures being smaller than SIE so an SIE calculated using daily data which will be more accurate, which will be more SIA-like, should yield a smaller value. And using the daily rather than the a monthly data does almost always yield values smaller than the monthly cell SIE value. Examining the size of the 'boost' in SIE through using monthly cell data rather than averaging daily figures (and ignoring 1987 which has what looks like artifacts of the change in data sets) the size of the 'boost' does vary quite a lot through the year, smaller boosts during max & min ice, larger boosts during the melt/freeze seasons, particularly the freeze, and particularly October. There is also a lot of year-to-year noise which is of a similar order of magnitude as the boost. As a result of these 'boosts', the monthly cell SIE for December 2016 was boosted 620,000 sq km above the daily averages value while back in 2010, SIE was only boosted by 179,000 sq km, allowing 2010 to remain the Lowest December SIE using monthly cell data even though the daily trace for December 2016 was significantly lower than the 2010 daily trace for the entire month. For the curious, here are the full-record average boost for each month (thousands of sq km), with the average for the last 10 years in brackets to give some indication of trends. So the 'boost' to SIE monthly numbers due to averaging grids over the month rather than averaging daily SIE, that boost may soon be a thing of the past for the headline monthly SIE. Cato, it also depends on the latitude, of course. Melt ponds mostly start forming in May, as far as I know, but really get going in June. This also depends on melt onset, which in turn depends on downwelling longwave radiation (ie when it is cloudy). When a high pressure forms over the Beaufort Sea and stays there for a while (as suggested by current forecasts), at this time of year, it can pull ice away from the Canadian/Alaskan coasts. This open water may not freeze over again and give the melting season in that region an early boost, especially this year as it's mostly first-year ice (no MYI barrier after last year's melt). And of course, it will cause export of thicker ice through Fram Strait. Myabe it is time to revisit the Maslowski prediction. 80% from 1979 volume is likely to be reached this year. This would vindicate is prediction. Al Rogers, thank you for explaining the NSIDC SIE numbers in detail. As a result of the NSIDC monthly method you describe, the last week rapid refreeze in September caused NSIDC's Sept 2016 to end up at 5th place at 4.72 , while calculation methods using JAXA or NSIDC average over Sept daily numbers would have put Sept average at 3rd place (at about 4.4 or 4.5 M km^2). Because of the odd way in which NSIDC calculates the SIE monthly numbers, it is quite sensitive to sudden jumps in refreezing or melting, which makes the number less predictable. Which also makes it harder to 'predict' that number in the entries for SIPN. Now, the average of total melt for the past 10 years is 18269 km3, which means that at the end of this year's melting season the minimum could be only 2526 km3 (the lowest minimum on record reached in 2012 was 3673 km3). And I don't even want to think about the sentence you wrote after that. One of the ways in which this "boost" can be boosted is with increased mobility of the ice - which is exactly what we are experiencing. Imagine a largish floe which is being merrily transported along in a vaguely continuous fashion, but is neither melting nor growing. Now consider what happens if the transport rate is such that the trailing end of the floe reaches the position previously occupied by the leading edge, but about 5 or 6 days later. Over the course of a month, the swathe path covered by such a moving floe would be approximately 5 or 6 times the actual dimensions of the floe itself. However, using the NSIDC monthly averaging technique, the entire swathe path would be classified as ice-covered extent, as (apart from edging effect) each grid cell would have been covered for the requisite time. Under such conditions, the monthly extent clocked up for the floe would therefore be approximately 5 or 6 times the actual size of said floe. Obviously, the transport rate chosen for the above example represents a worst-case scenario. Nonetheless, it would be easy for a slower-moving floe to drift over a swathe path which considerably exceeds its own dimensions. Consequently, under the existing NSIDC averaging technique, it would be the swathe path dimension which gets included in the overall monthly average, rather than the actual floe dimension. I think that in as far as you floe does not reduce the ice concentration in the pixel it left behind below 15%, you are correct. Either way, the sensitivity to timing of refreeze and melt in any pixel in the NSIDC ice concentration maps, makes the NSIDC monthly average numbers less consistent and less predictable. For example, in my SIPN entries, I found that Sept SIA is more accurately predictable (SD of residuals about 250 k km^2) in June than is NSIDC's SIE number (SD of residuals about 340 k km^2). "... in as far as you[r] floe does not reduce the ice concentration in the pixel it left behind below 15% ..."
Exactly the same condition applies at the leading edge as one approaches the month end. Perhaps I can explain best by means of an example. Consider a floe which is 5 grid cells wide in the E - W direction, and one grid cell in length measuring N - S. Imagine that this cell drifts (say) west to east at a rate of one grid cell/day, and that the 30 grid cells to the east are clear of ice. Under these, admittedly extreme, conditions, the floe - which has a grid cell size of 5 units - would rack up 27 units in terms of the monthly extent, as cells 5-31 are ice-covered for >15%. Regarding the Stnd Devs of your residuals (250k km^2 for SIA versus 340k km^2 for SIE), there is an intriguing equality which can pop out of the numbers. Using NSIDC monthly values, the 1979-2016 grand averages for September SIA and SIE are 4.64 million km^2 and 6.31 million km^2 respectively. When I'm looking at SDs for different sized objects, I usually do an informal normalisation by dividing each SD by the arithmetic mean size of the relevant object. I expected the "normalisation" to produce a closer result, but that's just bloody spooky. Once again, I would just like to say "D'oh!". A "rapid refreeze" at 2016 minima, is a total numerically driven misconception giving a cognitive optical illusion , it did not happen. Since the weather which followed heavily favored an influx of continuous Cyclones which have created the record warmest Arctic Ocean winter in history, there was always a greater deal of open water than our measurement methods permit to realize. Suggesting that there was a rapid refreeze has no climate data (judged by months) , to back it. A sudden rapid freeze up of a huge area, say Siberia, gives very High pressure Anticyclones greatly amplified by the radiation escaping to space in darkness, which is what Anticyclone do in darkness. Same happens over the Arctic Ocean, a rapid freeze up of a huge area, like Hudson Bay suddenly and drastically changes the weather of its entire surroundings, even the circulation pattern of the Polar vortex. One may say whatever they want to say about anything, but I prefer correct interpretations. Observation perfection is very alluring, since it explains reality. There was in fact, no rapid consolidated refreeze, but continuous chaos, like sea ice pack was molecules in a just starting microwave, the ice moves in a higher degree of kinetic energy only stopping when the energy is exhausted (by deep cooling). This does not happen when there has been a prolonged refreeze caused by a incredible warming . ......Warmest winter in Arctic history does not make for deeper refreezing starting earlier than usual. Bill, thank you for pointing out that a floe can more than quadruple its presence on the NSIDC monthly average simply by moving around. That is on top of the sensitivity to timing of refreezes and melts. All in all, this makes NSIDC's current method rather sensitive to events that have no relevance to sea ice extent or area. With us here being part of the community, what do other people here think ? Should NSIDC change their method of calculating the NSIDC monthly average (to simply taking the average of daily numbers over the month) ? The argument I posited can, of course, operate in the opposite sense. In the example I gave using a floe which was 5 grid cells in width, the monthly extent would register as 27 grid cell units, despite the fact that the actual size of the floe was 5 units. Consider what would happen in the example I gave if the width of the floe was 4 grid cell units rather than 5. Under that scenario, the NSIDC monthly averaging technique would register no cell with occupancy greater than ~ 13%, and would consequently assign an overall zero value for the month. However, owing to the inherent asymmetry caused by the 15% selection rule, the over-estimates and under-estimates will not simply tend to cancel each other out. The first example I gave caused an over-estimate of 22 grid cell units, whereas the second only introduced an under-estimate of 4 units. "The 2 Degrees North Pole Expedition"
The sleds weigh over 80 kilos and new pains and aches show unexpectedly in places you don’t want them, like my back. On the odd break, I would get the notebook out, jot down the GPS position while Ann pokes into the snow and yells the various snow depths to me. The rest of the day we are doing cold management: toes we don’t feel anymore and need nurturing or placing your thumb between the fingers to warm them up inside your mitt, and worse letting your arm hang so the blood can race back to the extremities. lots of snow! -41 C with wind chill? The 1 or 2 degree trips are very good ideas as long as the Pole is open, spasibo! People sometimes ask me what surprises me most about climate change. I haven’t had an answer for them because I haven’t been surprised by anything about climate change, until now. I’m surprised by how much arctic sea ice has deteriorated since 5 years ago when I started following it. I’m hoping against a new record minimum volume this year. Jim Hunt, that's a link to a conference in which Michelle Thaller of NASA talks about denialism and it's very good. I know your often battling GW denial, so thought it might help. The PIOMAS volume numbers are running so low this year, that it is almost scary. The extrapolation of 'volume' by PIOMAS hits ground zero much earlier than the extrapolation of 'extent' of sea ice. So I guess this year we will know if summer heat melts 'volume' or if it melts 'extent'. I think a new low minimum volume is a very strong probability at this point. The question is how low. I am sure the base management of this team heading towards the Pole reads Neven's blog. Don't get me wrong, I am completely convinced that the climate emergency we all see unfolding in the Arctic is real, and potentially catastrophic. Still, I can't help but notice in our comments and in our constant scrutiny and analysis of the data a certain note of frantic desperation--we seem to be trying to convince ourselves--we're cherry-picking, and we're crying "wolf". Looking at all this from a purely public persuasion/propaganda perspective, (which now, is about the only point of view that really matters) a troubling thought occurs to me. No matter how badly the Arctic ice volume, area and extent is diminished this summer, if it doesn't shatter the 2012 record the denialist community is going to seize on our concern as irresponsible alarmism. Or worse, they will simply declare the failure of the 2012 low-ice records to fall as evidence of the Arctic ice's "recovery". I really don't know what to do about this, but I thought you all really need to understand how you appear to an outsider, even one who is not hostile to your message. Science needs be practiced to be valid, denialists are shooting blanks and hitting the lay already unconvinced. If 2012 minima record is not broken, it will be because the clouds did their usual job, or because cyclones came and stayed the entire summer. What fake skeptics miss, and they usually are willfully blind, is that we are at all time low records now, don't have to wait till mid September, and most days are at all time low records, the only thing high is the heat, all time warmest winter by a huge margin. The only other thing high are the fake propagandists who think they know science. Elisee, first of all, your brush is too broad. This isn't some homogeneous organisation where image can be controlled through hierarchical systems of decision-making. Even though they are bound by a shared concern about the potential consequences of Arctic sea ice loss (and AGW in general), the visitors of this blog and the Arctic Sea Ice Forum are as diverse as can be. Some are alarmist, others are conservative, and so on. Secondly, climate risk deniers who are only interested in deceiving their fellow human beings, will always be able to find some exaggerated quote by some guy. I mean, over 10 years ago some ex-scientist said that there would come a time when British children will never see snow again. This meme is trotted out every winter, and projected onto the entire scientific community and the IPCC. If we are going to worry about that, we might as well stop talking (which is the whole idea, of course). Let them do the lying and misleading, while we each individually try to analyse and speculate about Arctic sea ice loss as honestly as we can. And let the reader judge for him/herself how trustworthy, credible, interesting it is what he/she reads on this blog and the forum. And last but not least, what you're engaging in here, is pure concern trolling. And if there's something I dislike more than climate risk denial, it's that. By your own logic you are providing fodder to climate risk deniers ("one guy tried to warn the stupid alarmist watermelons, but noooo, they wouldn't listen and announced the end of the world in every single sentence they wrote"). So don't do it again and take your concerns elsewhere. I must admit I used to say that we had to be careful what we said as the denialists would just use our own words to make their arguments. But, as time has gone on and denialists have lost argument after argument, in the face of ever impending catastrophe, I just don't care what they say any more. If they can't find something you have said to throw at the uncaring, they'll just make it up anyway. Things are so much worse than even the worst predictions, that any level of histrionics has it's place. Personally my view is we're already screwed and people don't care enough (yet), to even try and put it right. That doesn't mean we shouldn't try and we should not raise awareness. Just that I've reached my BS tolerance and am into personal mitigation for me and my family rather than trying to prove the evident to people who don't want to know. Here is an amazing article that presents information and interpretation of CO2 data in way that is startling and frightening. Much other global CO2 information understates actual atmospheric levels because of intentionally understated country emissions. The graphs presented are the best I know of. The journal article is behind a paywall, but I saw this news article and thought it would be of interest to folks here. Also, thank you Neven for your posts and the aggregation of data sites under the ASI graphs link! "Fossil fuel CO2 might be increasing. The IEA numbers might be wrong. They rely on nations to accurately report their fossil fuel use. Not all of them do, especially when it comes to burning their own coal supplies. In fact, the lack of a system to accurately verify national CO2 claims was a key issue in the Paris Climate Accord discussions. The worry is that as nations face increasing pressure and scrutiny around their CO2, the incentives to cook the books will increase. Incorrect accounting of just one percent globally could switch the storyline from "hopeful plateau" to "continuing acceleration". The IEA devotes two chapters of their "CO2 Emissions from Fuel Combustion" report to the various issues impacting data accuracy." "In today’s world of deniers, false news, and a desperate need to address climate change, emotional irrelevance is a luxury we can no longer afford." Here's a very fine photo collection of Arctic melt: Arctic ice in retreat: NASA's airborne survey shows how global warming is transforming the Arctic by Andrew Freedman. Wayne in particular will be interested to note that the dotted lines at the left show maximum and minimum air temperature over the preceding 24 hour period. The thermistor 1 reading is now in column 2. 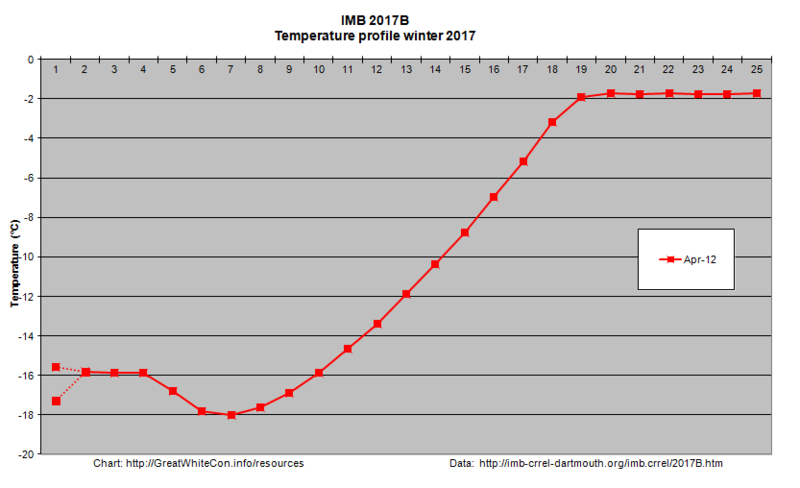 At around -16 degrees Celsius things have warmed up considerably near the Pole recently. Thanks Susan. Yeah, there is something in the way Thaller explains it that just seems to cut through and nail it, as with that quote. Also thanks for the link to the great article and breathtaking photos. 2017b has very little solar irradiance variance at the moment, but none of the top 3 or 4 are colder than the surface reading, this is highly unlikely. In other words, sea ice Cp makes T variances much slower than air. To sum it up, the Mass Buoy surface temperature reading is a better approximation of top sea ice temperature than top 3 or 4 thermistor actual readings. As a guide to seasonal thermal evolutions, this is absolutely crucial to consider. Wayne - Bear in mind that air temperature increased from ~-30 to ~-16 over the course of April 11th. My take is that thermistors 1-3 (in columns 2-4) are in air, and 4-5 are in snow. of which thermistor 1 may be in air the other in snow 7 to 9 cm thick. I have learned by multiple observations that surface air temperature varies very little in 2 meters. A colder top of snow by 2 C may have a .2 C temperature inversion to the surface air height. 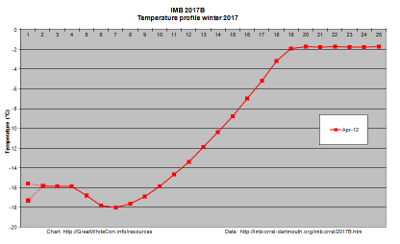 2017a top thermistor variations were impossible, and that is because the sun varied in altitude a lot more. The mere presence of rays causing bright snow affect thermistors. Even in a shade right next to lit snow, because light scatters and travels very well below its skin. The article I mentioned above by Barry Saxifrage is not behind a paywall as he does not charge anything to publishers for use of his articles. It is his way of contributing. His graphs on CO2 accumulation are very important as they show that atmospheric CO2 is rising ever more quickly despite lower energy use in many countries. Where is this CO2 coming from? one graph shows the increases up until very recently. The black bars at the top of the right hand of the graph are the recent numbers. Scary? Last two years average increase 3.0ppm, last five years 2.5 ppm, 1996 to 2006 2.0 ppm increase. Slightly OT, and perhaps mentioned elsewhere, but I found this interesting. Great picture of bergs off Newfoundland. That's quite far south. I tried to copy it here, but it came out too large, so will leave it at the link. See the Arctic Image of the Day thread on the forum. Thanks, done, and cbc link therein. Fascinating! Article on passing 410 ppm CO2 for the first time. Passed 400 in 2013 so that's 10 ppm added in 4 years. President Trump has, in three short months, approved the Keystone XL and Dakota Access pipelines, moved to slash the Environmental Protection Agency's budget to its lowest level in 40 years, and issued orders to roll back the Clean Water Rule, the Clean Power Plan and climate research and science. When we abandon science, we abandon informed democracy. It's worth considering the viewpoint of the politically active. In the first 100 days there have been multiple court cases to block executive orders from Trump which restrict movement of people from countries which, if you are looking with a fair view, are likely places where a threat to the people may come. Even blocking executive orders before they are implemented. Yet we see no court cases blocking Trump from causing threat to the people by removing the initiatives designed to reduce the threat of CO2 impact. Something the US Military have been threat assessing as "high" for a decade now. In short the impression I get of the people of the US is that they don't want their people to be safe now and they don't want their children and grandchildren to have a safe future. Well if it does anything to restrict their "freedoms" now anyway. I know this is not quite fair and not strictly correct. But then impressions aren't are they?? NeilT, please don't generalize. Granted the Kochtopus and others have been busy taking over authorities (they dominate in 31 states), Republicans are not in the actual majority overall, nor do they represent their own constituents, but rather their big funders. They are using multiple forms of trickery, and a huge amount of money, to block reality. Sad. Meanwhile, there are 17 Attorneys General suing the feds and several other lawsuits under way. But, you have to admit, the response to the block of free movement of certain people was faster, more robust and straight to court where it was supported by the judges. If only we had the same movement on CO2... But we don't. Not only don't we but Trump was voted in on a clear agenda which included hampering the ability to reduce CO2. Hence my somewhat abrasive remarks. We will survive Trump and his anti Climate Change rhetoric as we have survived others. But it does beg the question as to what the priorities of the US people are. "They are using multiple forms of trickery, and a huge amount of money, to block reality. Sad." Yes, sad, and one of those forms of trickery was Trump told people many of the same lines FDR used to get people to vote for him, like he was going to be a president of the regular person etc., however the difference is Trump didn't mean any of it. The R's keep fooling less educated people into voting against their own best interest by claiming an allegiance with them, when in reality they just want to help those that fund their campaigns; super wealthy individuals and corporations. That's why the American people would be much better off using taxpayer money to fund campaigns, i.e. campaign finance reform, but it never gets off the ground because the R's don't want it, because then they would be fighting for the American people and it's much more lucrative to align their interests with the super wealthy. It's a system that originated to be for 'The People' but has become corrupted to be for 'The wealthy' just like healthcare. The same thing is happening to water as privatization takes over and water rates go through the roof. We use to pay 36 dollars every two months and now we pay over a 100 a month. Why? Privitization means shareholders always want more. Yes Hans. As Bernie said about the billionaires that rule the nation : "Their Greed Has No End.". Right now, when we are about to find out if Arctic sea ice follows the PIOMAS "volume" graph of a fast decent to an ice free Arctic within this decade, or if it follows the "extent" graph that follows suggests an ice free Arctic around mid-century, right now we are faced with a US legislative forum that denies Global Warming, and will do nothing to curb the carbon emission trend. Rob, given that seasonal cold and heat have a much larger "visual" impact on extent I'd say the Arctic will follow the volume line. Seems logical as volume reflects ice lost, regardless of area, whereas extent just reflects where it's cold enough to freeze in winter and strong enough to not quite melt out in summer. Oh well, it looks like Louisiana, Florida, Shanghai, and Myanmar all get obliterated at some point in the next few centuries. Let's not forget much of Coastal Texas, Mississippi, Alabama, and all the U.S. east coast states too. There'll be Hurricanes making landfall in Arkansas at some future date in a few centuries. I wonder how Global Climate will be effected whenever the Gulf Stream can just cut straight across Florida, due to sea level rise, instead of being squeezed between Florida and Cuba? About this time of year I start looking at the Nares Strait on Worldview to see how the ice bridges west of Greenland are holding up. This year I see it's been open for a month already. Joffan7, Yes indeed. I've been watching the condition of the ice above Morris Jesup and it's been looking like Swiss Cheese since late March. It's also moving east... to be exported through Fram Straight I suppose. The Beaufort is also a mess and I think the area north of Barrow & Prudhoe Bay opened up around the 10th of April. I'm having flashbacks to watching the ice leave Belmont Lake which I mention here from time to time. Should prove to be an interesting melting season as always. I took a wild swing at answering the "Volume versus area/extent" question on the ASIF. My simplistic number crunching came down on the side of volume. 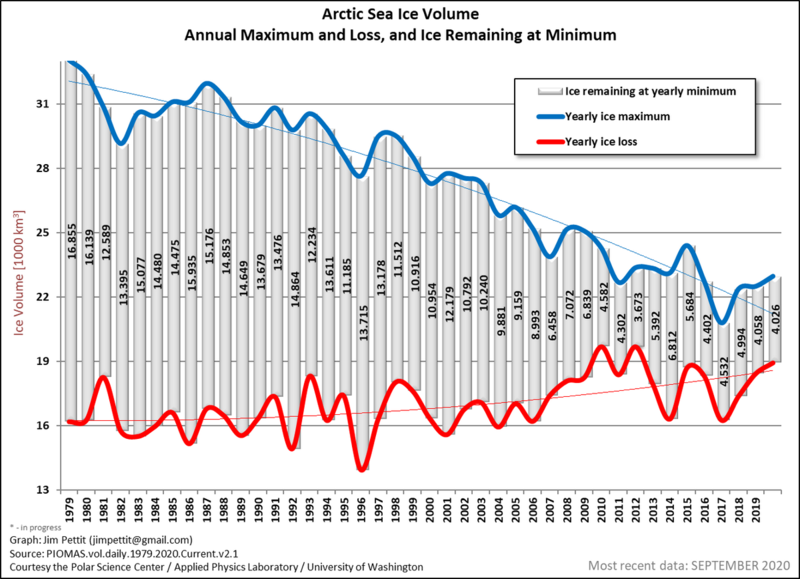 Curves that have an accelerating decline followed by a decelerating decline have a better fit to September Arctic sea ice volume than a quadratic curve or other curves that continue to accelerate the decline. The decline of September Arctic sea ice volume seems to be decelerating, and that should become more apparent in coming years. Probably the trend in volume decline will (continue to) decelerate and the trend in extent decline will accelerate. Both curves will be right in the end. NeilT and Hans, thanks. Don't worry, (1) I take it all with a large grain of salt and (2) I don't blame people for being appalled at what is going on, not only in the US, but the UK and elsewhere (France on hold?). I've studied a lot of history and we humans have often been a sorry lot, unable to stand up to exploiters and looters who seek power and gelt. Meanwhile, life goes on, sorry about no time to reply where people have responded, will be a while yet. Best to return to the ice, where the news appears not to be good; still, it's reality, not politics. I get your drift Susan, but reality is only as good as it converts to acceptance via data & projected trend, then in this case all out action (on the part of the US), but sure looks like this coming melt season will be a potentially big dose of reality based on how it's starting out. I suppose at this point we have to wonder how big a dose is needed to move the needle. There is no reality dose big enough to convince people who think giving more money to the wealthy will induce the greedsters to share more. "Job creation" in throbbing tones, forsooth! Meanwhile, those who give a pass to the real villains because of their passion to condemn those they label "corporate democrats" are only weakening the resistance by demanding "purity". Who among us is innocent of modern conveniences? I admire those who walk the walk, but we cannot defeat out and out hypocrisy and villainy with less than 10% of the population. Been very busy, but I found a few things, namely, thermistors are UV sensitive (coming article), so most top buoy thermistor readings need be very carefully scrutinized with time of day and weather conditions, best advice is to consider them accurate when very cloudy or very dark. Meantime I continued studying snow sublimation, which is turning out to be a very important player in Arctic surface temperatures. Is very madenning to try to get correct temperature readings within or near snow. Consider this sea ice season snow dominated, so my latest work is very timely. Today extent and Arctic temps are approaching the lowest previous low ice for the first time in many months! The numbers for extent don't look too bad but volume could be the real wake up call in a few days! Wayne: I'm curious: What happens to the thermal inversion during the transition from sublimation to melting? I'm assuming that direct solar heat absorption begins to drive the process... but I'd think that phase transition energies would still be causing inversions? But it gets overwhelmed from too much heat as the sun rises, similar to measuring a material covered with acetone, a warmer surface would mask the cooling detected on previously cooler surface, of course provided one does not know acetone is on the surface. Just found out, when windier and sunny, top of snow vs surface air temperature difference is greater than when the wind calms, this is text book correct. The significant problem is measuring accurately, I have measured 3 to 4 C cooler top of snow than surface air, it seems astounding that sublimation is responsible, more likely residual temperature from previous colder days. Today was more like .2 to 1 C.
I favor, .1 to .4 C cooling, because the math makes more sense. "top of snow vs surface air temperature difference LESSER than when the wind calms"
Indeed, we should look at GRIBB to see if a) it has a permanent Arctic winter inversion from surface to at least a couple of meters above or higher, and b) how long in the spring it keeps that inversion, if it has one in the first place. This will tell if the models incorporate this. My annual projection of weather events to come is out, and it has a lot of surprises, namely vast expansive thick snow layer related changes. Why vast? Because it was measured in the colder Arctic total atmosphere spanning hundreds at times thousands of kilometers by using the sun as a measuring template. However it turned cold very late in the winter season, perhaps making things worse for Arctic sea ice. This is bad. I just looked at the daily PIOMASS again, since I hadn't actually seen that in like a month, and this year's trend is very bad. If this continues through melt season, this will be the largest single year net melt since 2007. I'm wondering how screwed up the summer time climate will become in Alaska, Canada, Greenland, Northern Europe, and Russia, once we experience the first complete summer time meltdown in the Arctic? There will be a "net sea ice negative," which should translate into torrential rains, and even faster continental ice melting in the Northern Hemisphere. Although the computer climate models previously over-estimated the rate of warming five or ten years ago, I guess in a few more years they'll sort out the correct values needed for various positive and negative feedbacks, and the models may become more useful on a year to year or at least five year basis. At the average rate of melting from the past several years, we'd expect the arctic to start completely melting every year, starting in about 12 to 15 years. However, if this year's trend becomes the new annual trend, as some time increments have done in the past or a few years at a time, it is possible for a complete sea ice summer meltdown to happen within as little as 3 years. I wouldn't expect a winter meltdown to happen for many decades, if ever, due to being permanently in darkness, but then again, who knows, if enough land ice also melts over time, positive albedo feedbacks may actually get that strong. I think we are in uncharted territory if this trend continues, because it looks like a critical limit was passed some time during last year's very weak recovery season. I wouldn't read too much into that slight decrease in rate of average summer time melting. The five year running average is the most telling value, even though individual "Bad" years are what does the damage. The deceleration is explained by the curvature of the Earth. The Albedo feedback grows more slowly for each degree of latitude that ice and snow retreat northward, compared to the previous degree, because each degree of latitude actually occupies less area than the previous degree, and because the angle of solar incidence is weaker. For this reason, the curvature of the Earth is actually one of the largest "Negative Feedbacks" involved in the warming cycle. This system is highly chaotic, and a five year trend does not predict the damage that any one year can or will do to the permanent ice budget. The rate of CO2 increase continues to rise annually, in spite of cleaner, more efficient technologies, because the rate of population increase is rising faster than cleaner technologies can offset the pollution, and because some systems are already operating at or very near their theoretical thermodynamic maximum efficiency already. If the engines on the latest super-tankers are already 55% efficient, then improving them to 60% efficient won't make that much difference in the greater scheme of things, and besides all that, automobiles actually waste most of their fuel at red lights and stop signs. I don't expect the rate of pollution to peak until around the year 2080, when Global Population is projected to peak at around 12 Billion people. There is not enough room for thermodynamic efficiency improvements in carbon-based technology to offset more than one more decade worth of population growth. We need to convert 14% of per-capita energy consumption to wind, solar, hydro, or nuclear PER DECADE, for the next 6 decades, just to be breaking back even with the net pollution we currently make. Further, this is actually an under-estimate, because you may as well consider the Amazon toasted as Global Population rises by another Billion or two...people have to eat something, and the Brazilians are going to cut down those trees to plant crops, simply because it will be profitable to do so on a micro-economics basis, even if it is a bad move for humanity in the long term; People generally only care about their own livelihood, after all, and from a certain point of view, how can they be blamed? Nevertheless, it's unfortunate that the people of many nations in Africa and the Middle East continue to reproduce at a rate of 8 children per woman. I would expect there to be a mass exodus of people from these nations over the next generation or two, moving to Canada, the U.S., Brazil, and Argentina, simply due to the economics of food and water availability. I would assume man-made ponds for terrestrial fish farming will become more popular as well, presumably in locations not suitable for agriculture, simply because fish is one of the healthiest meats to consume, and because the oceans and lakes are already severely over-fished as is. I don't yet know how this model will be sustained, because nobody makes the sorts of mega-structures an idealist, such as a sci-fi author, might suggest to sustain this, but that never stops humans from consuming, or else wasting, everything available anyway. There are ways in which the Earth can support 12 billion people at modern standards indefinitely using Wind, Solar, Hydro, and Nuclear power, and there are ways to produce enough food for them without cutting down all the rain forests. However, it is much cheaper and easier to cut down all the forests in the short to medium term, and since individuals and corporations are mostly concerned with profits, I suspect the pattern of destroying everything in nature will continue much as it has for at least the next two generations; Democratic governments are never going to get the number of votes which would be needed to pass legislation which actually has enough substance and force to set about preventing this. I should point out that the subtractive math involved in the annual net CO2 gain does not work the way most people may intuitively think it works. That is to say, doubling the world population will not simply double the net annual CO2 gain. By the time the population stabilizes, around 12 Billion, the annual net gain in CO2 is probably going to be something like 8PPM per year, or more, and not the 4 or 5PPM per year you might expect intuitively, and you can expect similar behavior in the Methane curve and Nitrates curves. One of the purposes of Governments and Civilization in general is supposed to be to ensure that the "Micro" and the "Macro" do not destroy one another. That's the point, people are supposed to work together for the benefit of all. Republicans in the U.S. mostly believe that Government shouldn't do anything besides raise a military, and give free incentives to whatever corporation is padding their own pocket, and they believe governments should somehow do this without raising any taxes whatsoever. They know they can't actually get this, but it's really their long-term goal. Trump plans on cutting the corporate tax rate to less than the personal income tax rate, and claims this is going to somehow stimulate the economy to offset government deficits. This is simply untrue. History shows that the budget has only ever been balanced under much higher tax rates than what the U.S. currently has, for example under the Clinton administration.